Each of the six systems consists of a controller, shaker, sensor, STU subsystem, software, monitor scope, cables, consumables, and documentation. Our basic 4511A system, capacity up to 150 grams, has the normal shaker and a sensor with a mounting area of 22mm (0.875in.). It can always be upgraded with a monitor, larger shaker, sensor, or advanced software. The Model 4511L comes complete with the heavy duty shaker, a 50mm (2 in.) sensor , advanced software, and various options including the shaker shipping case and flex protector. Our largest Model, the 4511M has the heavy duty shaker and advanced software but sports a multiple crystal 100mm (4in.) mounting surface for the largest hybrids. The relay test specification given in MIL_STD 39016D requires a wider shock pulse than the requirements of MIL STD 883 or 750. Our -R series systems meet this requirement with a wide pulse width shaker and software. Finally, the 4511M6 is the largest system with a 150mm (6in.) 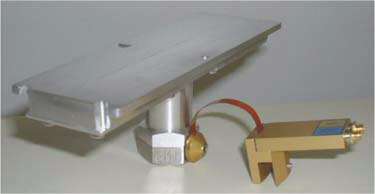 sensor with five crystals for testing the largest parts to the MIL STD. Options include Calibration kits, Shaker Dust Seals, and Sensor flex protectors. All of the system performance is controlled in software so we can tailor a system to your exact specifications including custom shock and vibration features in your system. We manufacture our own shakers and sensors so we can customize them to your requirement. To insure that your PIND system is always performing at its peak, SPECTRAL DYNAMICS, INC. has developed a comprehensive maintenance program including complete system diagnostics, repairs, and exchanges. ALL with the accuracy provided by complete calibration and certification traceable to National Standards. Military standards require that each system – including sensors, amplifiers, thresholds and display monitors be calibrated annually. However, to minimize costs over the long haul, SD recommends that you start your calibration interval at six months and then extend it to one year after you have sufficient confidence that operational procedures are correct. After each calibration, we issue a 30-day warranty-or extended warranty if you prefer. And we offer priority two-day service or even same day when your PIND system is something that you cannot do without. SPECTRAL DYNAMICS, INC. also provides a complete training program for users at all levels of experience. Our comprehensive two-day training seminars explain the intricacies of system operations, testing methods, particle behavior, calibration procedures, failure analysis, repair and maintenance procedures, and the latest military specifications. These seminars consisting of lectures by experts and hands-on laboratory sessions are conducted in California. Or if you prefer, we will provide an on-site training program at your location tailored-made according to the specialized needs of your company.